Xing, J., Liu, Q., Zheng, K., Ma, J., Liu, X., Yang, H., Peng, X., Nie, S., and Wang, K. (2019). "Synergistic effect of Fenton-like treatment on the adsorption of organic dye on bamboo magnetic biochar," BioRes. 14(1), 714-724. Magnetic bamboo charcoal was one-pot synthesized and employed in the removal of methylene blue. 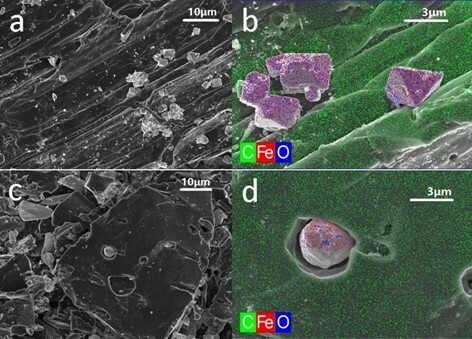 The data indicated that three different oxidation states of iron (Fe3O4, FeO, and zero-valent iron) were generated under different pyrolytic temperatures, and the maximum specific surface area was 484.6 m2/g. Both physical adsorption and catalytic degradation of MBC with zero-valent iron exhibited more effective capability to decontaminate organic pollution, as the zero-valent iron acted as a Fenton-like catalyst under aerobic conditions. In addition, the obtained magnetic bamboo charcoal manifested the maximum absorption-degradation capacity of methylene blue which was 73.6 mg/g under the weakly acidic (pH=5) and high temperature (60 °C) conditions, which broadened the applications as compared with the classic Fenton catalyst. Water pollution by organic contaminants is a serious environmental problem and is receiving signiﬁcant attention. The immoderate release of effluents containing organic dyes could impede sunlight penetration into water, reducing the photosynthetic reaction of plants. Some synthetic dyes may cause severe health threats to human beings (Zhu et al. 2012). Dyes are captured from effluents by adsorption (Tiwari et al. 2013), which has become popular because of its low cost, convenience, and efficiency (Moussavi and Mahmoudi 2009). Activated carbon (AC) has attracted much attention in recent years due to its micropore structure and high surface area. AC is a suitable option for the effective removal of organic contaminants (especially hard-biodegradable pollutants) from aquatic environments (Meshko et al. 2009). Recently, bamboo charcoal (BC) has been applied because of the specific micropore structure and strong adsorption capacity (Zhang et al. 2014; Vignesh et al. 2016). However, the traditional carbon adsorbent could lead to blocking of the strainer filter and the dispersion of carbon dusts in the processed water (Ai and Jiang 2010). Magnetic separation is one option due to its low cost, simplicity, and high efficiency. Magnetic charcoal could solve the problems in the traditional way of separation and conserve energy. Considering the advantages of BC, the efficient and low-cost preparation of magnetic bamboo charcoal (MBC) by loading magnetic particles on the surface could result in efficient separation from effluents (Zhu et al. 2014). The natural porous structure of BC could be critical to the adsorption for organic pollutants (methylene blue) (Chen et al. 2012). The types of ferromagnetic particles are different with the different processes, such as MgFe2O4, γ-Fe2O3, and Fe3O4 (Luo and Zhang 2004). Zero-valent iron (ZVI) could be employed in the degradation of organic compounds (Oh et al. 2016), and microscale (150 μm) ZVI particles have been applied in decreasing subsurface permeable barriers by chemical reduction of chlorinated solvents (Hoag et al. 2009). This study reports a bamboo-derived magnetic charcoal for the adsorption of methylene blue dye. The adsorbent combines large specific surface area, high adsorption capacity, and a convenient separation method. The MBC specimens were fabricated using bamboo charcoal and bamboo powder as a carbon source, which were referred as CMBC (magnetic biochar from bamboo charcoal) and PMBC (magnetic biochar from bamboo power), respectively. The composites served as a substrate of carbon in which the ferromagnetic particles were strongly bound to the carbon, not surface-only anchoring. 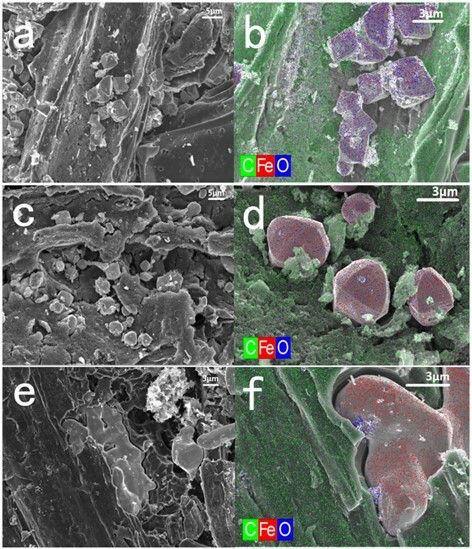 An additional process of carbonization was crucial for the formation of the extra graphitic structure and pore structure. As a result, the ferromagnetic particles become embedded in the biochar by simple immersion-pyrolysis method and act as a Fenton-like catalyst to enhance the adsorption process. The magnetic bamboo charcoal combines the specific micropore structure and strong adsorption capacity of the bamboo charcoal and catalytic performance and magnetism of the ferromagnetic particles. Bamboo charcoal (BC) from Phyllostachys edulis was purchased from WenZhao Bamboo Carbon Ltd (Zhejiang, China), and the five-year-old Moso bamboo powder (BP) was collected from Taipin Experimental Station (Anhui Province, China). Analytic grade ferric chloride hexahydrate (FeCl3·6H2O) and ferrous chloride tetrahydrate (FeCl2·4H2O) were purchased from Alfa Aesar Inc. (Beijing, China). Ammonium hydroxide (NH3∙H2O) (28%) was purchased from Beijing Chemical Works (Beijing, China), and the methylene blue (MB, 98.5%) was purchased from Xilong Chemical Co., Ltd (Shanghai, China). All chemical solutions were prepared using deionized (DI) water. In a typical procedure, 30.0 g of BC or BP was mixed with 40.5 g of FeCl3·6H2O, 29.9 g of FeCl2·4H2O, and 250 mL of DI water. Next, 50 mL of NH3∙H2O was added dropwise, and the black deposit was separated by centrifugation after 3 h of aging. The prepared biochars were magnetized by pyrolyzing under N2 in a tube furnace, and referred to as CMBC600-1000, and PMBC600-1000, respectively, in which the suffix number represents the pyrolytic temperature. All samples were stored in a vacuum desiccator. The crystal structure was determined by XRD (Philips Electronic Instruments, Amsterdam, Holland), and XPS measurements were carried out on an ESCALAB 250Xi spectrometer (Thermo Fisher Scientific, Waltham, MA, USA). All Raman spectra were recorded using a confocal micro-Raman spectrometer (Horiba/Jobin Yvon HR800, Dublin, UK) with an exciting laser source emitting at 633 nm. The porosity of the samples was evaluated by N2/77 K adsorption using the Autosorb iQ-2-MP (Quantachrome Instruments U.S., Shanghai, China). The morphological characteristics and elements distribution of the samples were studied using FESEM (operating at 3 kV, and a working distance of between 5 and 15 mm) with energy dispersive spectrometer (EDS) (Merlin, Zeiss, Germany). The magnetic properties were analyzed using a vibrating sample magnetometer (Lakeshore 730 T, Westerville, USA). where C0 is the initial concentration of the dye solution, CA is the final concentration of the dye solution after adsorption process, m0 is the quantity of the adsorbent, and V is the volume of the dye solution. The yield of the MBC was reduced with increasing temperature (Table 1). This finding indicates that the intense pyrolysis at higher temperature led to greater burning losses. XRD diffractograms show two peaks around 2θ = 26° and 44° in Fig. 1a and three peaks around 2θ = 14.9°, 16.3°, and 22.5° in Fig. 1b. These features represent the typical amorphous structure of BC and crystalline structure of BP, respectively (Tran et al. 2017, 2018). a The values were based on the starting material, and the standard deviation is less than 5%. b IG: Integration of the G band; ID: Integration of the D band. For the MBC samples, major diffraction peaks of CMBC600-700 corresponded to the crystal planes of Fe3O4, which were further confirmed from the typical peaks of carbon (C 1s, 285.0 eV), oxygen (O 1s, 530.0 eV), and iron (Fe 2p, 710.5 eV) in the XPS analysis (Fig. 2). Two distinct peaks at 711.4 and 725.5 eV were assigned to the binding energies of Fe 2p3/2 and Fe 2p1/2 (Fig. S1b), which suggested that a spinel structure was successfully synthesized in the CMBC700 sample (Jozwiak et al. 2007). Surprisingly, completely different XRD curves were noted with further increasing of the pyrolysis temperature, and typical FeO and zero-valent iron (ZVI) were detected as the temperature reached 800 °C and higher. The Raman spectra also exhibited two typical peaks of carbonaceous materials at 1330 cm-1 and 1597 cm-1, which are dominated by sp2 (graphitic structure, G) and sp3 (defect structures D) hybridized carbons, respectively (Fig. S1) (Marshall et al. 2005). Clearly, the values of IG/ID ratio were distributed in a narrow range of 0.17 to 0.27 (Table 1), and they slightly increased with the carbonization temperature. 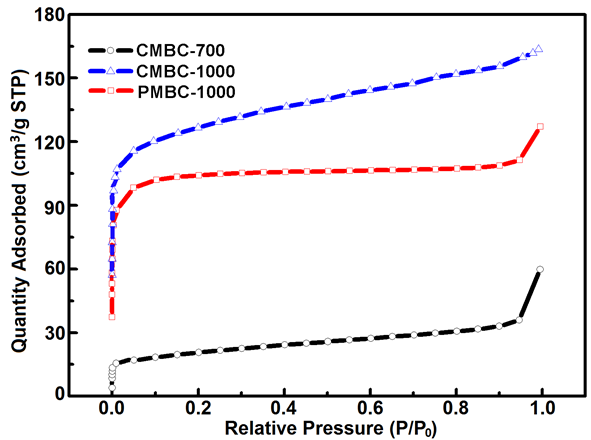 The magnetic composites from both BP and BC exhibited the supermagnetic behavior during pyrolytic temperatures higher than 900 °C (PMBC900, PMBC1000 and CMBC900, CMBC1000), as the Hc values were lower than the theoretical value (Hc ≤ 50 Oe) and the Mr was nearly zero, which corresponds to superparamagnetic particles (Morel et al. 2008). In comparison, the relatively higher Ms values of PMBC samples were likely due to the higher weight of iron oxides caused by more burning-loss amount of PMBC. The morphological variation along with the pyrolysis temperature was intuitively reflected from FESEM and corresponding EDS elemental mapping (Fig. 3). The morphological variation and crystal transformation were closely related to the extensive reduction interactions between the iron oxides and carbon from BP or BC. After the 700 °C pyrolysis, the octahedral Fe3O4 with a clear edge was only attached onto the surface of biochar. At 800 °C, the Fe3O4 nanoparticles consumed the surrounding carbon to generate FeO, which is produced at 740 °C (Elgeassy et al. 2013). Parts of FeO were inlaid into the biochar, forming a more compact structure, and the shape changed to a polyhedron. Further reduction reactions occurred along with the increasing temperature to create ZVI (confirmed by the data of the valence transition temperature at 870 °C), and the solid particles were entirely embedded into the biochar. Moreover, the less-crystalline ZVI was easily coalesced, resulting in a formless aggregation. A similar morphological variety of metal particles was found in the CMBC samples (Fig. S2). However, the ZVI core (3 μm) in CMBC was much smaller than that in PMBC (10 μm), which was the main difference. This difference reflected that the higher proportion of metal particles in PMBC than that in CMBC benefited the fusion and formation of bigger ZVI particles. In a Fenton-like process, solid iron mineral catalytically degraded the dye/organic pollutants by forming the generation cycle of hydroxyl radicals, avoiding the generation of large amounts of sludge and high concentration of anions (Shahwan et al. 2011). In this work, the adsorption capacity (qe) of MBCs was apparently raised with increasing pyrolytic temperature (Fig. 4), corresponding to the data from specific surface area (SBET) analysis (Fig. S3). The maximum SBET value was determined to be 484.6 m2/g of the CMBC1000 sample. Notably, the increased qe values were much more than the SBET data, unlike the theory of the proportional relation between qe and SBET ( , C is a constant) (Liu et al. 2001). This difference was mainly ascribed to the additional Fenton-like degradation reaction as the generation of ZVI in MBC1000 simultaneously occurred during the physical adsorption. In addition, high temperature and neutral conditions were beneficial to the adsorption of MB, resulting from the higher diffusion coefficient and the enhanced electrostatic interaction of the cationic pollutant (Liu et al. 2001). Meanwhile, the obtained MBCs were used as the adsorbent of MB and easily separated with magnetic field (Fig. 5). In this study, a series of MBC from two carbon sources (bamboo charcoal and bamboo powder) were produced by chemical co-precipitation and subsequent pyrolysis at different temperatures. In addition to being easily separated by a magnetic field, the obtained PMBC and PMBC pyrolyzed at 900 and 1000 °C had high coercivity and superparamagnetic property. 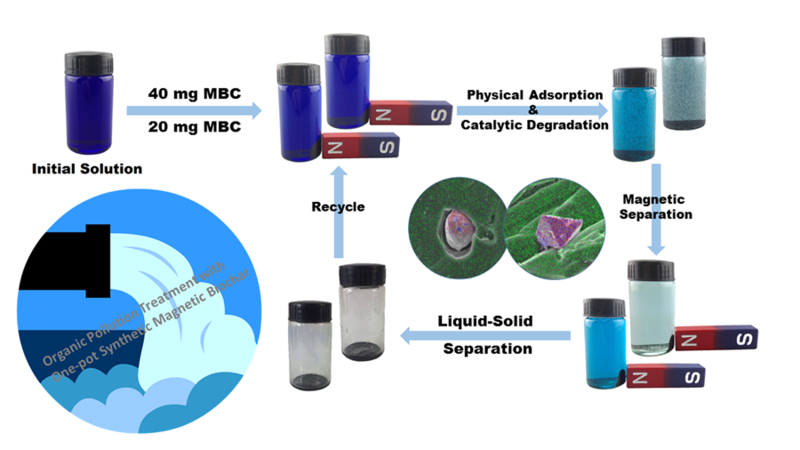 With the valence variation of iron under different conditions, the improved adsorption property of PMBC/CMBC was ascribed not only to the increased specific surface area, but also to the catalyzed degradation of organic pollution. The Fenton-like process efficiently oxidized the organic molecules at weak-acid and warm conditions, unlike a traditional Fenton’s reagent in which the pH values would be below 4. This work was financially supported by the National Key R&D Program of China (Grant No. 2017YFD0600804), the Open Fund of Guangxi Key Laboratory of Clean Pulp & Papermaking and Pollution Control (KF201722) and the China Scholarship Council (International Clean Energy Talent Programme (iCET), Grant No. 201702660054). Article submitted: March 13, 2018; Peer review completed: June 14, 2018; Revised version received; October 8, 2018; Accepted: October 9, 2018; Published: December 3, 2018.